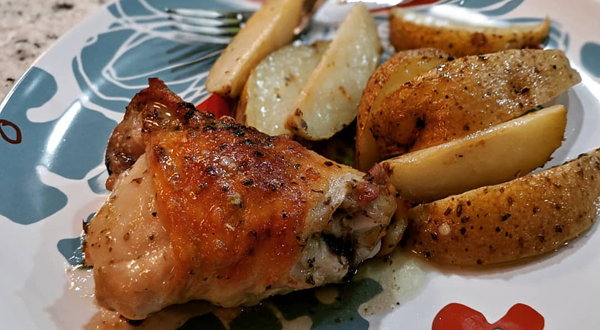 Last night, I made sheet-pan Greek chicken and potatoes for dinner, and it was absolutely delicious! It's also very simple. I used four bone-in, skin-on chicken thighs and seven small-to-medium white potatoes, cut lengthwise (this made dinner last night for Iain and me, and the leftovers will make dinner for another night), but the recipe can be easily adjusted to make more or fewer servings, and you can substitute chicken breasts — just take care to adjust the cooking time accordingly so you don't dry them out. Mix the lemon juice, lemon zest, salt, pepper, oregano, garlic, and olive oil in a large bowl. Put the sliced potatoes into the bowl and coat them well with the mixture. Using a slotted spoon, so that the excess mixture stays behind in the bowl, transfer the coated potatoes to a lipped sheet pan. Spoon some of the mixture underneath the skin on the thighs, then coat the outsides of the thighs in the mixture. Lay the thighs on top of the potatoes. Add the chicken broth to the pan. (Be sure not to pour directly on the thighs or you'll wash off the mixture.) Cover with tin foil and cook at 375F for 20 minutes, then turn up the temp to 390F, uncover, and bake for 25-35 minutes, until the skin is nice and brown. Voila! 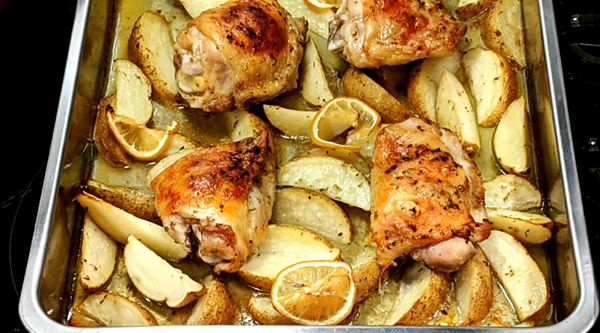 Greek chicken and potatoes! Lots of veggies go really well with this dish, but my personal favorite is wilted spinach with garlic. Yum!